I attended a variety of track sessions in the afternoon of the OpenStack Silicon Valley Community Event. Part 1 can be viewed here. Mohamed: PLUMgrid’s baseline is on Neutron. It is our entry into OpenStack. One problem is L2 underlay, because it doesn’t scale. Second problem is Overlay. Upstreaming code is a challenge. Lacour: We are trying to build public cloud at Dreamhost. Dreamhost has always been built on open source. L2 virtualization is provided by VMware. L3 and above is implemented internally. Most of the 300,000 customers are end users, not enterprises. Today Neutron isn’t up to speed with IPv6 though Juno is getting there. To have intelligent overlays and cheap fast dumb underlays is great for us. Balland: Working on high level abstractions. Congress. VMware has had full-time developers dedicated to Neutron and Quantum before that. Geneve will replace GRE. MacDonald: ETIS is European Telco Standards Institute, wrote a manifesto for all of their vendors at 2018 to deliver their network gear as Software instead of aggregated systems. Started in 2012. When telcos have the agility of virtualization, they can achieve a lot. Lot of POCs so far. Taylor: VNF performs the means of a telco in software. Traditionally telcos demanded standards and would wait 5 yrs or so. Now they no longer have the luxury to wait and need to get stuff done now. ETSI has defined a framework wherere vendors and Network Operators can get together and demonstrate some capability to drive the industry forward. We already have a virtualized session board controller in Europe. Challenge of network people is to convince carrier that the solution is carrier grade. Carriers feel that OpenStack has some challenges, such as packet processing. Telcos feel that their ability to innovate is hindered by the very small number of vendors they work with. In the ETSI manifesto, they say that they can source workloads from a much broader ecosystems, who are more nimble. Telcos have learned from the lesson of WhatsApp who facilitate free text messages and then got bought for $19B as an example of a competitor. Telcos feel they need to get up to speed. Wright: Service chaining is the ability to steer packets through a collection of services such as a set of logical services (Firewalls, Load Balancers, IDS, etc) in the proper order. SDN steers the packets, Service chaining is how an SP will package these services to customers. Service Providers want a general purpose compute platform, and that is a cloud problem. ODL has OpenStack integration that can help NFV. There is also a service chaining project. Overall ETSI NFV project identifies a suite of open source technologies such as from DPDK and ODL. To have elastic flexible infrastructure is the biggest gain to shift from CapEx to OpEx. Kavanagh: Telco vendors must be able to pick and choose various servers on vendor boxes and chain them together ala service chaining. Ericsson is virtualizing their entire product portfolio. Challenge is the time to market. NFV will shrink lead times tremendously. ODL is a good complement to Neutron; we will see more advanced services like BGP being added. Telcos are looking into NFV to reduce the lead time. and virtualize their key services to compete with Amazon. They also see OpenStack as a good fit because it also reduces costs. Lin: Diff b/w SDN and NFV: SDN is about automating and orchestrating SW-driven platform. ETSI has unique applications, like stateful apps. how to tie into OSSP systems, how to handle latency-sensitive apps that are cannot exist in a stateless form. We should not reinvent the wheel, e.g. IP VPN. Contrail technology is based on a standard that was co-authored by AT&T and Verizon. NFV is more service orchestration and service delivery than how do we transport packets. Challenge is how do we expOpenStacke this as a service and improve the orchestration. Lin: VMware is running its Internal cloud on OpenStack since 2012, which is used for development, test, demos, pretty much everything. Ebay is one of their first customers. NSX is multi-hypervisor, hence OpenStack. Main pane of glass is vSphere. With so many moving parts in OpenStack, it is important to understand the amount of scale you’re looking for. Out of the box, they get great performance with STT, investigating DPDK. They can send traffic directly from hypervisor to hypervisor, which reduces traffic a lot. LaCour: He spoke of a Dream Host OpenStack-based cloud offering called Dream Compute, mass market public cloud offering that has IPv6 Dual Stack support for customers as well as back-end systems, L2 isolations for every tenant, and drives cost down (went with white box switches running Cumulus Linux so that their operating team could be generalist. Spine and leaf 40G switches b/w spine and leaf. 10G access switches, 10G storage networks (i.e. storage based on ). They believe that overlays enable simpler physical networks. Their overlays are with VMware NSX, and they were one of the first Nicira customers. They used them because it had the most solid L2 support. They don’t use their L3 solutions because they didn’t have supoprt at the time, so they implemented their own, using Akanda (a router virtual appliance that has Neutron extensions). Their L3 service appliance uses iptables in Linux. Storage networks are separate from data networks, minimal overhead. Each tenant gets a single router appliance that is booted independently and ephemerally and can be as small as 256MB, 512MB with more features. They expect Dream Compute to go GA next year. 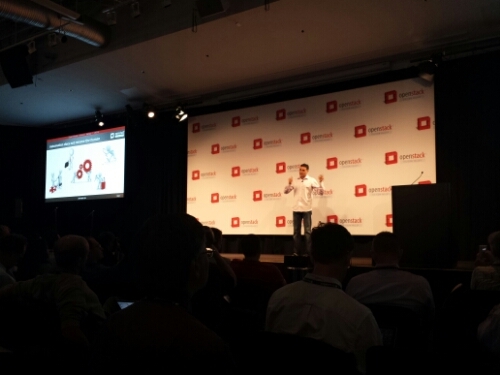 Johnson: Midokura does Network Virtualization Overlays for OpenStack. KVH is the customer, member of the Fidelity group, providing Managed Private Cloud for financial services customers. MidoNet is an OpenStack overlay for isolated private cloud environments that provides distributed features (Load Balancing, Firewall, routing), not just distributed L2 services. It programs the Linux kernel to do packet processing; uses VXLAN. They saturate their Mellanox 40G uplinks with 37G. Patterson: Symantec grew by acquisition with several BUs and 58 DCs around the world. They consolidated many of them via OpenStack. They offer services such as object storage, batch processing, authentication, etc, i.e. more than just IaaS. They use Bare metal for their Hadoop and Cassandra + OpenStack Nova environment. For the SDN layer, they used something to supplement Neutron, and ended up going with Contrail for its MPLS over GRE capability, though they are moving to VxLAN. To speak to the bare metal side, they used a Docker-like layer so that each tenant on the Computer virtualization side has to authenticate before talking to the Big Data side. In one environment, for leaf-spine, they use Cisco and in another they use Arista with only generic vendor agnostic features being implemented. TORs are 4x40G into the spine, spine is a 2x, moving into a 4x. When they used generic OVS, every vendor outperformed OVS in the bakeoffs. They saturated the uplinks from the TORs to the spines. Interestingly, none of the 4 panelists used OpenFlow at all in their clouds. 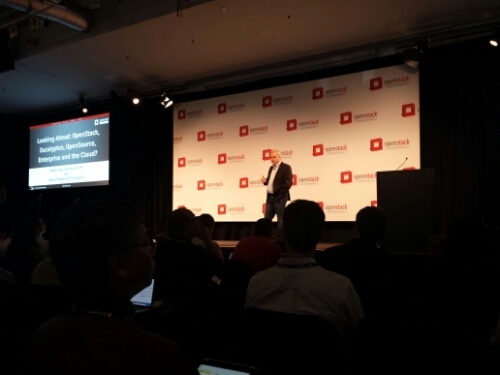 This is a live blog of the inaugural OpenStack Silicon Valley Community Event, held at the Computer History Museum in Mountain View, California on September 16, 2014. It was put together by Mirantis, one of the biggest proponents of OpenStack. The Agenda and Megathemes for the Day is given by Alex Freedland, Mirantis Co-founder and Board Member of OpenStack Foundation. Freedland states that as someone who’s been involved with OpenStack since the beginning, four years ago, he has noticed a distinct qualitative change in OpenStack. We no longer have to prove that OpenFlow will win the open cloud game. It is here to stay and will be the open cloud platform of the future. The question we have to ask is “What will it look like when it matures and how will it appear to enterprises, service providers, etc?” Freedland feels we are entering OpenStack 2.0 and this event is about OS 2.0. Now that we are in the 2.0 territory, we are seeing a lot of huge deals, with some large companies entering at massive scale. The usage patterns we see are of agility and management. It’s necessary for Software Defined Economy to detect change quicker. In just four years, OpenStack is at least as large as Linux. Next, up is a keynote by Martin Fink, EVP and CTO, HP and a late inclusion, Marten Mickos, CEO, Eucalyptus. The title was Looking ahead: OpenStack, Eucalyptus, Open Source, Enterprise and the cloud? As HP recently announced plans to acquire Eucalyptus. Martin Fink and Marten Mickos present a look ahead at what this holds for open source, the cloud, the enterprise and OpenStack. Eucalyptus is open source private cloud software that supports industry standard AWS APIs and creates cloud resources for compute, network, and storage. Ross says Brocade has been involved with OpenStack for 3 years and has increased its level of investment. Brocade’s contributions include SAN FibreChannel for Cinder, Multitenant DC-DC via MPLS, and NFV ETSI POCs inc. scheduling, FWaaS, and VPNaaS. 80% of NFV discussions are centered around OpenStack. Challenges: Neutron maturity – it has evolving functionality in cusotmer engagements (big spectrum of customer asks across releases, Folsom, Grizzly, Havana, and Icehouse, which makes it extremely difficult to be agile in development). Another challenge is for the SDN community and Open Daylight community to understand each other better. No matter what size your organization is, it’s not moving fast enough. Software innovation is make-or-break. If infrastructure isn’t part of the solution, it’s part of the problem. Time for the keynote from Martin Casado | CTO of Networking, VMware on Policy for the Cloud Frontier. He comes to the stage with extreme energy, as if he just sprinted 100 meters. Casado: Automation is great. Everyone loves the promise of all cloud operations codified as running programs tirelessly doing the work of dozens of operators. Unfortunately, today we can only automate infrastructure and applications——ideals for cloud behavior that are more concerned with business logic, regulations, security, risk management, and cost optimization than infrastructure and applications. As a result, the policy layer presents a new challenge in our quest for cloud automation. In this talk, I will discuss the policy problem and why it is an emerging area we should focus on. I will then discuss Congress, an OpenStack effort to create an open policy framework to help us as a community step into this new frontier. Casado: “Automation does not remove the human. Automation is necessary but insufficient for removing humans from the cloud control loop. Humans still need to interact with cloud to make it obey business policies. Policy is the Holy Grail of IT. The Policy problem is as follows: Humans have ideas, humans can document ideas, systems don’t understand human languages. Non-technical people with non-technical ideas want to dictate how the system works. Somehow we’re supposed to get this to work on the backend. How OpenStack can crack the problem is as follow: Computer Scientists will want to write a declarative language, which will need a compiler to implement this in the System. But such policy systems have always existed and have their flaws. Traditional barriers are 1. Device Canonicalization (lowest common denominators are Cisco, Juniper, Brocade, Arista, etc) that fail because of the interoperability, 2. Distributed State Management (e.g. at 5 am person XYZ is probably not in a proper state of mind, so don’t give him access), and 3. Topology Independence (if you choose a language that is independent of toplogy, you require mapping from physical topology to logical, which is very difficult). Many of these problems have been solved by OpenStack because of abstractions (no more device canonicalization problem). Software abstraction has been canonicalized. Primary value of A CMS is to present a consistent view, manipulate. Policy compiler can now exist over this with this level of abstraction present. He then defines Congress: An open policy framework for automated IT infrastructure. Every component (networking, storage, security, compute) has a policy layer. But they can only be used for that one component. High level framework has to unify them. it is an enormous hurdle to adoption to translate them. E.g. Application Developer, Cloud Operator, and Compliance Officer have separate ideas, but should be limited by the laws of 1 language. That’s what Congress aims to achieve. This is how it is the Holy Grail. Bias spoke of the groups with longer term vision (strategic business direction) and tactical teams with shorter term focus (release dev lifecycle). OpenStack doesn’t have a vision or product strategy. There are so many new projects coming up that it changes the meaning of OpenStack. But there is no shared vision or ownership at the top. By product strategy for open source projects, we need product leadership, not a benevolent dictator. Some requirements include: managing it like a product (even though it isn’t one); focus on end-user needs and requirements; have long term vision and long term prioritization & planning; have corporate independence; closer workings b/w Board and TC; and architectural oversight and leadership. He respects AWS in the sense that it has a small architectural review board, a product management function (team of PMs per product line). Suggests having something similar: (Architecture Review Board elected for 2-4 years, having a wide set of domain expertise; and PM function with specific domain expertise. Kemp said that the interoperability b/w products and services is what will make OpenStack successful in the long run. The goal should be to have zero consultants, zero additional headcount. Movie studios using biotech companies, space agencies, using Nebula solution. The final keynote was by Adrian Ionel | CEO, Mirantis on OpenStack 2016: Boom or Bust? Ionel spoke of the growth adoption of OpenStack. He said that the measure of success is actual workloads. AWS is $6B business. Collectively OpenStack doesn’t even scratch the surface of that number. Docker has had 20M downloads over the past 4 months. In the end, Developers win. They are the vanguards. They don’t care about deployment choice of monitoring software, which hypervisor is used underneath, what the scalability of the network layer is, or which storage system is used for volumes. What they do care about is API quality and ease of use, feature velocity, and portability. He suggests focusing on the APIs as the key to adoption, investing in ease of use vs even more flexible plumbing, not moving up the stack (e.g. XaaS) but rather partnering instead, reshaping upstream engineering (i.e. technical committees) to foster open competition (vs central plumbing), and enabling workload mobility to other platforms. Mirantis signs 2 new customers a week, however, it is early days yet. And OpenStack needs to be able to scale appropriately. Three fireside chats followed. The first was Is open source cloud a winner-take-all game? Mickos: In a digital world with exponential development, you do see Winner-Take-All examples, e.g. Linux and mySQL. But exceptions exist. He quoted Linux Torvalds as “If Linux kills Microsoft, it will be an unintended consequence”. Customers just want value. Not many companies have the depth and breadth of skill that HP has. They believe in hybrid clouds; that’s why it stands out. Wilson: Innovation isn’t a zero-sum game. There are different solutions for different people. If you declare victory at this point, you’re living in a bubble. You’re ignoring AWS, VMware. It is heterogeneous by definition. CloudStack is the most active solution in the Apache community. It doesn’t make sense to have a winner-take-all game. I don’t think OpenStack and CloudStack compete with each other. CloudStack is very easy to use and works at scale. Thousands of CloudStack deployments exist around the world. The Netscaler and Citrix team already contributes to the OpenStack world. Xen contributes to hypervisor component of OpenStack. We will work with whatever cloud infrastructure our customers use. Renski: There is an opportunity for only 1 standard open source cloud. There is only space for 1 winner. Enterprises and technology-centric organizations invest a lot in their infrastructure and OpenStack is the only way to solve their problems. The sheer number of vendors who have come together to solve problems with minimal disruptions to the tenants is the core advantage of OpenStack. Ffoulkes Enterprises are moving slowly and don’t like lock-in. OpenStack is moving fast. There will be mergers and acquisitions. Customers’ have difference challenges, e.g in one country deployment can be on-premises, in another must be off-premises. There’s a high cost and complex for enterprises to build DCs of their own or have private clouds. It is going to be a slow journey for customers in non-IT verticals to migrate to public clouds. Maitland OpenStack hasn’t lived up to process of workload portability, but containers will help as they are super efficient and fast. The response to Docker is encouraging. As soon as there is a single semantic deployment model for OpenStack, the floodgates will open on the enterprise on-premises side. But it is a gradual migration. Perilli There is a massive gap b/w expectations and reality. Customers ask if OpenStack is a cheap version of a virtualization layer that they can get from other vendors? That is a misperception. Vendors are not preaching OpenStack properly; they are confusing and scaring customers by saying this is the new world. They need to transition from scale-up model to scale out model. You need to have something on top that glues the scale-out with the scale-up. Enterprises generally take a long time to make such decisions. In order to increase adoption, what’s missing from OpenStack is the capability to think beyond what OpenStack can offer. It needs to be coupled with other layers that can be merged with OpenStack in a seamless way to enforce policies that large enterprises need. We’re still looking at the foundation. Shalom: There are different reasons why open source projects succeed and fail. e.g. mySQL succeeded because it entered a proprietary space with a cheap solution that delivered Alternatives were expensive. Also, Docker went from disruption to commodity in 6 months or less. They entered a very small space that few people were addressing, and was timely. For OpenStack, RackSpace realized that they couldn’t compete very long with AWS. They built a coalition with OpenStack. You go into coalitions because there is no other option. Open Source changes the dynamics in that things that are commodities should be free, and those that add value should be paid for. With Android, Google created the gravity that allows allows open source developers to contribute. It is not healthy for companies to argue for equal rights. Gentile: Open Source needs to attain an unmet need. The development of distribution methodologies of open source is superior than proprietary ways. If all the physicists of the world held tight to their discoveries and work, where would we be? Donaldson: Mass adoption from a community perspective must comes with acceleration. Enterprise customers often like licensed model, which might work. Somebody has to pay the bills though. This concluded the morning session. I will cover the afternoon session in Part 2. FATAL: Module openvswitch_mod not found. I could have simply typed the following instead with the same consequences. As per the documentation, module-assistant aims to facilitate the process of building kernel modules from source. In other words, this needs to be run each time the kernel is upgraded. In December 2012, I participated in a contest on Scott Lowe’s blog and won a copy of Kevin Jackson’s OpenStack Cloud Computing Cookbook. I’ve been reading it to progress my OpenStack lab and have a few thoughts on it. The most important thing to keep in mind about this book is that it is not about the design philosophy or goals of OpenStack. If you are looking for an OpenStack 101 book, this is not the one. It is very simply, a cookbook with precise recipes or tasks to set up and manage OpenStack cloud environments, and doesn’t pretend to be anything other than that. Hence, it is very difficult for it to be a meaningful and long-lasting book. This is unlikely to be on my bookshelves in a year or two. OpenStack has been evolving very rapidly and at the time the book was published, in September 2012, OpenStack came out with a new release – Folsom. The book was developed on the Essex platform, which was around April 2012. Folsom is a major release as it contains the Quantum networking component. Consequently, the book only covers Nova Networking (Chapter 10), which supports Flat networking, Flat networking with DHCP, and VLAN Manager. With, Quantum, users are presented a backend platform from which they can leverage plugins to pick network services from many vendors. Similarly, there is no mention of Cinder, the full-blown component that covers block storage. Instead, the book only talks about Nova Volumes (Chapter 8) for block storage support. Chapter 11 discusses how to provision OpenStack in Data Centers and discusses the tools and techniques for automating tasks. The absence of DevStack is notable here. Chapters 12 and 13 cover Monitoring and Troubleshooting respectively. Most of the 100-odd tasks are written in a three-tiered Getting ready / How to do it / How it works format. It is not a book you would read from start to finish; instead you would pick tasks that are important to you. However, though there are several screenshots and code snippets, there is not a single diagram, either block or network. This is another major shortcoming in the book. One would expect at least a few of the How it works sections to have diagrams to illustrate, conceptually, how the task was realized, such as the flow of packets between VMs in Chapter 10 (OpenStack Networking). However, it is a good resource for monitoring and troubleshooting tasks and might serve your needs there. Otherwise, my biggest complaint of OpenStack Cloud Computing Cookbook was that it was largely obsolete on the day it was released.